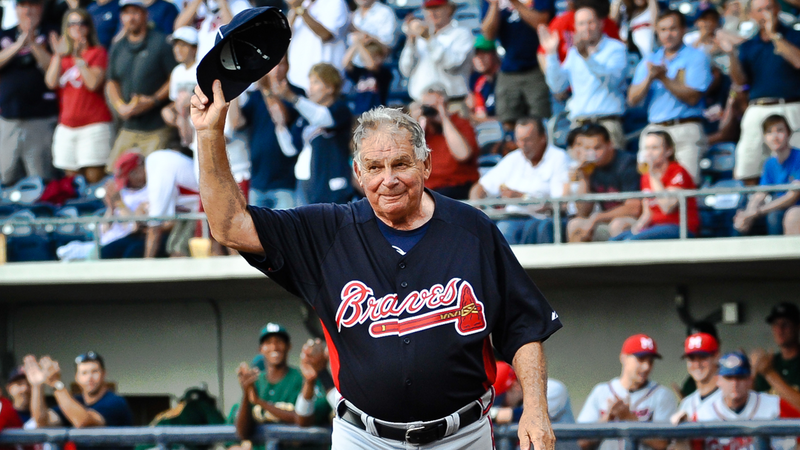 LAWRENCEVILLE, Ga. - The International League announced today that it will induct former Richmond Braves player, legendary Atlanta Braves manager, and National Baseball Hall of Famer Bobby Cox into its Hall of Fame as a member of its Class of 2019. Cox will be officially enshrined by the league in a ceremony at Coolray Field prior to the Gwinnett Stripers' 6:05 p.m. game on Saturday, April 6. He will be presented with "The Curtain Call" statue by IL President Randy Mobley and will also throw out the honorary first pitch. In addition to the pre-game ceremony, the Stripers will also be honoring Cox by giving away replica "Hall of Fame" jerseys in the Stripers' classic green. The jerseys that will feature Cox's name and number on the back will be given away to the first 2,500 fans at Coolray Field. "The Stripers are honored to host Bobby Cox for his International League Hall of Fame enshrinement," said Stripers Vice President and General Manager Adam English. "As the Triple-A affiliate of the Atlanta Braves, we have the unique opportunity to pay tribute to Mr. Cox for his numerous contributions to both our league and our Major League organization. We look forward to participating as the IL bestows its top honor on a legendary Baseball Hall of Famer." Cox played for Gwinnett's Triple-A predecessor in Richmond, Va. in 1967, batting .297 with 14 home runs and 51 RBIs to lead the R-Braves to an IL Pennant. Following a trade to the New York Yankees in 1967, he returned to the league with Syracuse in 1970 and was part of the Chiefs club that won the Governors' Cup championship that season. Cox went on to manage the Syracuse Chiefs for four seasons from 1973-76, compiling a 304-261 (.538) record in 565 games. He guided the club to three consecutive appearances in the Governors' Cup Finals (1974-76) and one Governors' Cup championship (1976). Following his time in the IL, Cox enjoyed a 29-year career as a Major League manager with the Braves (1978-81, 1990-2010) and Toronto Blue Jays (1982-85). The four-time Manager of the Year (AL in 1985, NL in 1991, 2004, and 2005) and 1995 World Series champion was inducted into the National Baseball Hall of Fame in 2014. Cox currently ranks fourth in MLB history in managerial wins (2,504).